You’ve Wished for Mobile Riches and We’ve Listened! Did you know that whatever you wish for at Sloto’Cash it is our job to make it come true? Well, maybe not every little thing you wish for, but we sure try and this time around we’ve listened to all your mobile wishes, which grant you a HUGE mobile match bonus once per week! 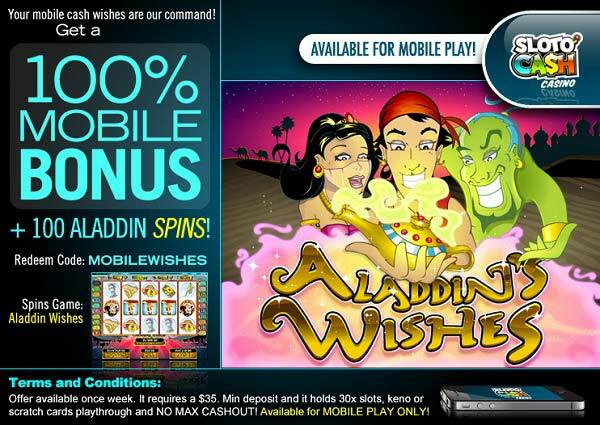 Play from your favorite mobile device this October and claim a spellbinding 100% Match plus 100 FREE Aladdin Spins! The reels of Aladdin Wishes will fulfill your commands when you land the lamp symbol on reels 1, 2 and 3 or on 3, 4 and 5 to play with a multiplier of your original bet, or 25 free spins. Encounter the same luck of Aladdin himself this October when you deposit as little as $35, play from your iOS, Android or Tablet device and your wishes will come true once a week with a 100% Match + 100 Free Spins!